*This book gave me ALL THE FEELS. It has been quite awhile since a book made my little black heart feel like this. I just loved all the sweet scenes between Ruby and Aaron. For a good portion of the book I didn’t always understand why they fell for each other like they did, but once they got to interact in person I definitely believed it and was 100% Team Ruron. *I’ve always been a fan of non-traditional formatting and the use of e-mails/texts/IMs. The first 40% or so is told that way and I was beginning to think that it was maybe a little too much when it changed instead to Ruby’s POV. It was actually a little jarring and first and I started to miss the texts and IMs when it changed again. While it did go back to primarily normal narrative style in the latter half, it still had some of the texts and I felt it was balanced well. *The Slooooow burn. I’ve read one other book by this author – who is known for her slow burn romance – and thought people kind of confused slow paced for slow burn. This one, though, while not at all fast paced, did not feel like a slow story. With the way the story was told in the first half there was no room for the extraneous text that can bog a story down. It was all character development and relationship building and banter. *Where the first half or so of the book had a steady pace, once it switched away from the e-mails/texts/IMs I felt it was a little repetitive. I felt like Ruby would kind of spiral and she would just repeat the same things over and over again and it really started to get on my nerves. I think that Zapata could edit things down just a bit and it would still have all the emotional impact with a few (hundred) less pages. *If this book had a soundtrack, then “Gorgeous” by Taylor Swift would play on repeat. Ruby spent SO. MUCH. TIME. thinking about how beautiful Aaron was and how she had trouble looking at him, etc., etc. It got old really fast. *While I liked Ruby, I found her kind of annoying. She was very sensitive and cried pretty much all the time. She also came across really immature a good amount of the time. *I didn’t like how Aaron was so insistent that Ruby shouldn’t get a full time job just because it wasn’t something she would love. I appreciate the fact that he wanted to encourage her to follow her dreams and do what would make her happy, but it just feels so impractical to not have steady income. She could’ve gotten a job and still done her business on the side until she figured things out. 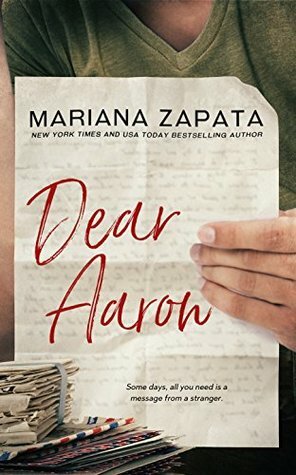 Overall, I did really enjoy Dear Aaron. Though there were obviously some things I took issue with, there were many funny moments and some great character development, and I totally shipped the romance. Aaron was just so, so sweet with Ruby and I couldn’t get enough of it. I’m looking forward to reading some more by this author. On face value, the shift in narrative delivery sounds like a natural course for online dating and talking to more in person. Which sounds about right, I think. I also can’t imagine following a lead who cried a lot of the time but glad you enjoyed in spite of this. Oh I hadn’t thought about it that way! (Behold my superb critiquing skills :-\ )That makes me a little more impressed with the narrative style choices. And yeah the crying definitely got my nerves, but there were enough other good things to overcome it. That’s high praise coming from you. I have enjoyed this author’s books and have this one on my Kindle. Her books are too long and I agree she could scale back and have less repetition. I’m glad to see how much you liked this one – now I’m excited to pick it up! I need a good romance with feels. Yes, her books are WAY too long. She overwrites a little too much, in my opinion. But I did really enjoy this one. I hope you enjoy it, too! LOVE how you split this review with like/dislike! I do like a good romance to switch it up now and then. Thanks! I always feel I go the Like/Dislike route when I’m having trouble organizing my thoughts and can’t figure out to write a good, coherent review haha. But I’m glad it comes across well! Woohoo!!! I am so happy this one gave you all the feels. 🙂 I hope her writing continues to do that. Great review. Thank you! This one and From Lukov, with Love have been my favorites of hers so far. I’m reading Under Locke right now and am not quite as impressed. A little too Alpha Male for me. You need to read The Wall of Winnipeg. I loved that one. Have you tried Wait for It? It’s her friend from that book. I haven’t done that one yet. I don’t remember liking that character very much, though, so I’ve been kind of hesitant. Would you say the romance is closer to Wall of Winnipeg/Dear Aaron or to Under Locke? Closer to Winnipeg and Dear Aaron. She ends up moving (to the same town as Under Locke), but she’s there as a single parent to her nephews. Worth giving a try if you still have KU. I would say it would probably be more your thing than Under Locke. I really liked Wait for It and Kulti. Ok thanks! I might try it then. Under Locke was just not for me at all. I think I’ll try some other books first though. I also like the way you format your reviews by separating the likes and the dislikes. It makes things very fair. Glad this one gave you all the feels! Happy reading! Thank you! Sometimes formatting things like that are the only way I can get out my thoughts. Those annoying elements are the price we pay for a cute squishy romance! Haha. Hooray! I hope that you enjoy it as much as I did!